Do not be anxious about anything, but in every situation, by prayer and petition, with thanksgiving, present your requests to God,~Philippians 4:6. Can any one of you by worrying add a single hour to your life?~Matthew 6:27. Think about the things of heaven, not the things of earth,~Colossians 3:2. Let this mind be in you, which was also in Christ Jesus,~Philippians 2:5. I heard a minister say something this weekend that hit me as true. She said much of our praying is worrying with our eyes closed. She said we are talking about our problems instead if talking to God who can solve our problems. I honestly believe we can worship the problems or circumstances in our lives. It’s called worrying and complaining. We are giving our undivided attention to the problem instead of focusing on the solution. We exalt the problems above God. How many times have you been in a prayer circle and everyone talked about and prayed only about the problem? There was no exaltation of God being above the problem. There was no worship of who God is and His ability to solve any problem. Instead of words of faith, there were words of doubt, unbelief, and planted seeds of worry. One of my favorite verses is, “God will keep in perfect peace those who’s minds are stayed on Him,”~Isaiah 26:3. You see it’s almost impossible to worship God and worry at the same time. When God is exalted, we see how big He is and how small everything else is in comparison. We can respond in faith to our circumstances. It’s challenging, yet it can be done. It starts with feeding our minds the word of God. When fearful thoughts come we can rehearse what’s deposited in our spirit. After muddling around in those negative thoughts for awhile I sensed the Lord saying, “No one can take anything from you without my permission.” God affirmed His position as protector and provider. My security is in Him, not my company. The evil one always presents the worst case scenario. What if you lose this job? What if you have this sickness? What if it’s the end of the world? He’s not positive and loves to see people worrying instead of worshipping and enjoying God. I will supply all your needs according to My riches in glory. I will see you through any and every situation. You are accepted in the beloved! You learn from your mistakes and move on. I will perfect everything concerning you. I will come again and set all the wrongs things right. God invites us to pray about everything and rest in Him! 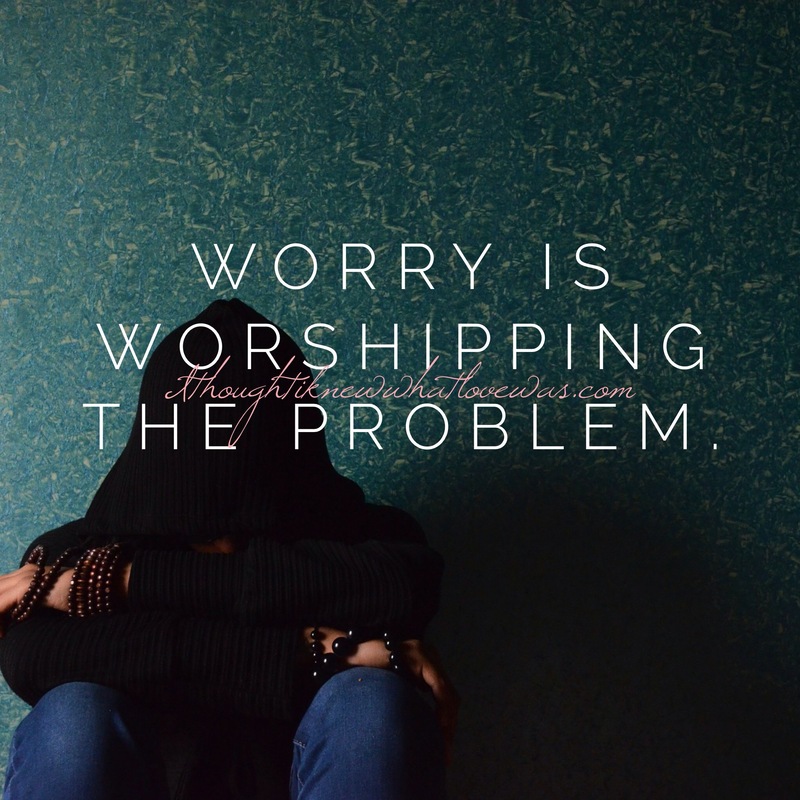 True worship isn’t ignoring the problem, it’s surrendering the problem to God. It’s staying focused on who God is and what He’s doing. Father, help us to set our eyes on you. To remain focused on you. Bless us with heavenly perspectives. Shower us with Kingdom revelation. May we cease exalting anything or anyone above you. May we rest in your unfailing love. In Jesus name, Amen! This entry was posted in Uncategorized and tagged freedom from fear, freedom from worring, God is good, Peace, read the Bible, worship God. Bookmark the permalink. Excellent word. Thanks for sharing. God bless you!!! You are so deeply loved.